Today’s autonomous region of Trentino, part of Northern Italy along with a more northern portion of territory called Alto Adige, is a natural multicultural border territory between the Italic peninsula and the Germanic regions beyond the Alps. 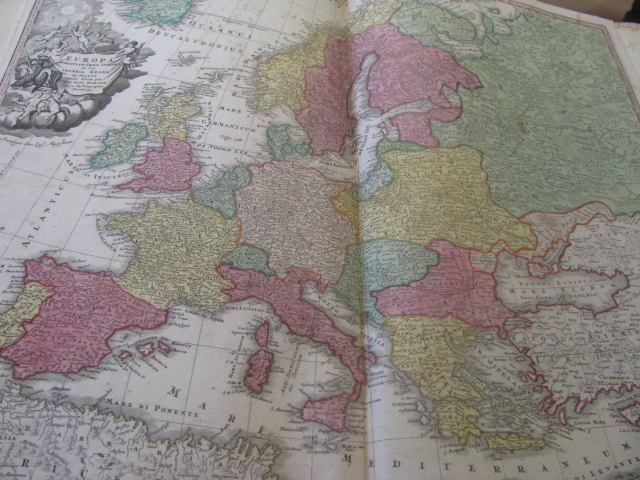 It has been this way ever since 1027 when the German Emperor Conrad II and the Holy Roman Emperors recognized the region’s strategic and political importance for those forces who moved from the Nordic territories to the Christian residence of the Roman Popes. 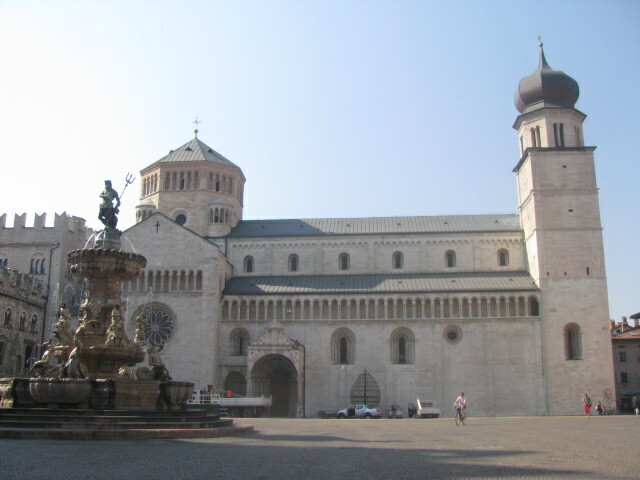 In the sixteenth century, as the most southern German speaking diocese, Trentino was also the location of choice for the Great Council of Trento from 1545 until 1563. 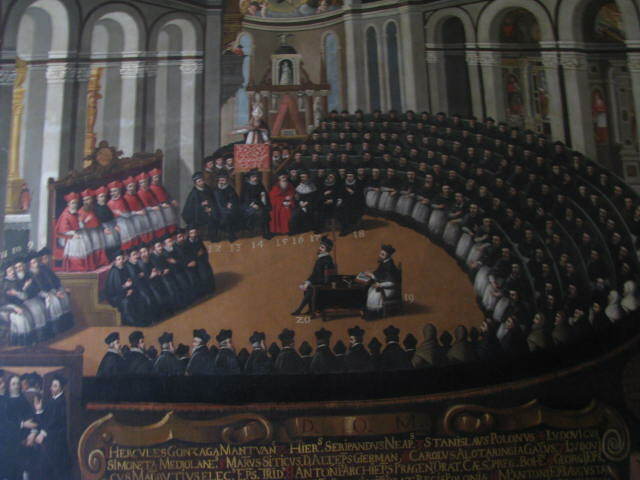 The international Council event had been planned over the course of several years by Val di Non’s native Cardinal Bernardo Clesio, Prince Bishop and Special Council to Charles V. Cardinal Clesio before the final implementation of the Council, which was then hosted by his successor, Prince Bishop Christopher Madruzzo, to satisfy guests and visitors. This major event brought in laborers, experts, international cooks and merchants with provisions from all parts of Italy and the world. Villas had been built or renovated. Armies and soldiers were placed on alert. Traditional markets were resupplied with popular and new ingredients to meet the expectations of people from around the world. 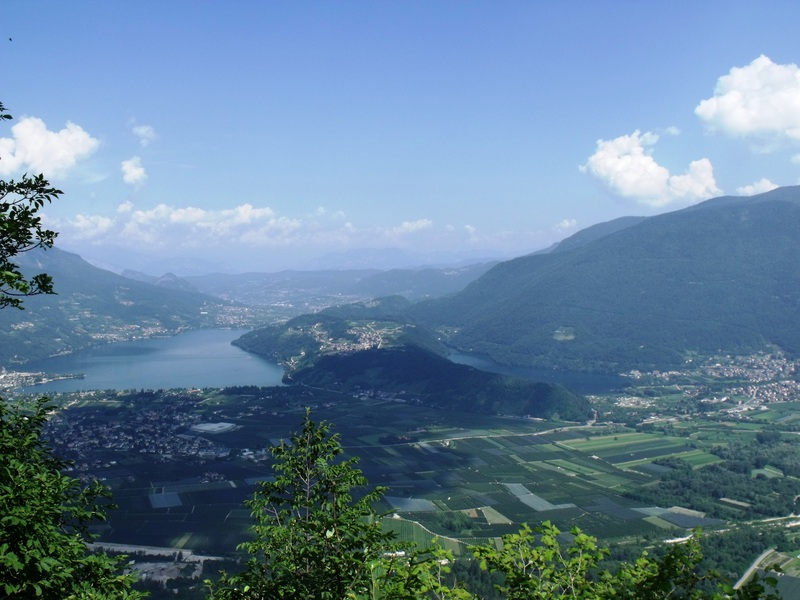 Surrounding areas began preparations to offer the best of best with Trentino’s lakes experiencing a surge of visitors during breaks in official Council negotiations. Lakes, then as now, were especially popular among tourists who liked to fish, sample lake-fish cuisine, hike, sightsee and plunge in the cool alpine waters on hot summer days. After the Council, the region remained part of the Austrian Hungarian Empire until 1919 when it was annexed by Italy in post World War 1 negotiations with Allied Forces. 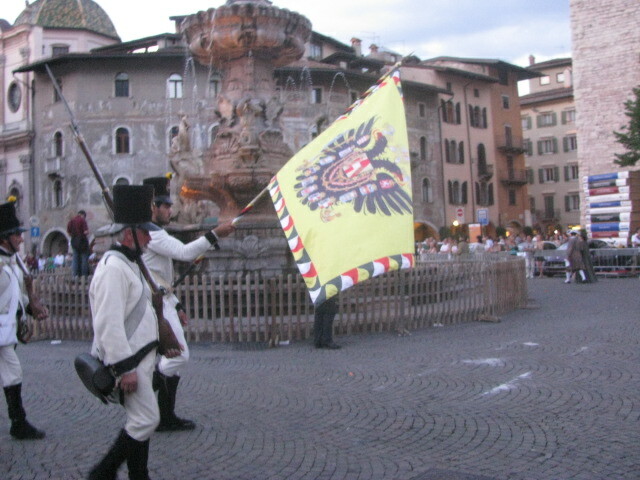 Among Italian regions today, Trentino and the northern area known as “Alto Adige” ranks 11th in size (about 13,607 square kilometers) and 16th in population (about 930,000 inhabitants – ItalianMade.com). 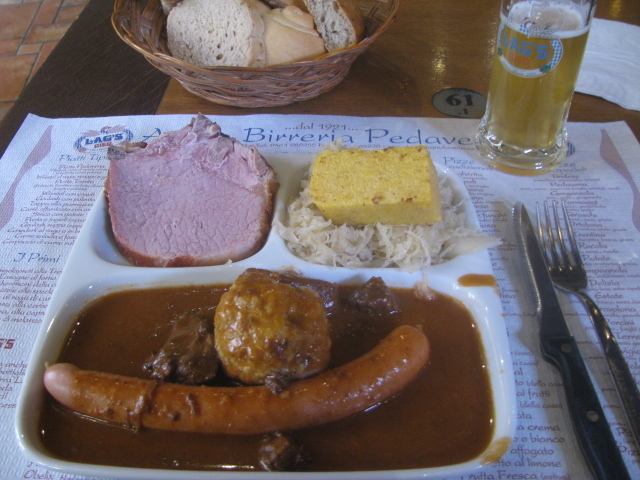 Serves typical Trentino lunches and evening meals as well as pizza, and locally brewed beer; regional specialties are hearty and include: wuerstel with sauerkraut, goulash [meat stew with paprika] with polenta [corn meal mush], trippa alla parmigiana [sliced and stewed tripe], canederli [fist shaped bread dumplings]in broth or with paprika-tomato sauce, strangolapreti [spoon sized spinach dumpling] usually topped with melted butter and sage, speck [local air dried ham – similar to country ham], polenta tosella e funghi [corn meal mush, pan fried cheese and local stewed mushrooms] besides 32 types of pizza and many typically Italian desserts such as tiramisu and profiterol. During the winter months the menu includes typical dishes such as bollito misto (boiled beef with green herbed sauce) or baccala’ (stewed cod fish). Strudel is always available, however, the zuppa inglese prepared the classic way with the old Alkermes liquer, sponge cake, and vanilla cream is a treat you should not miss. To know what the cook has planned for the day, besides the classic canederli, if you have set your mind on a certain regional specialty, I recommend you call ahead of time. The Trentino area is still blessed with abundant rivers and lakes, including Lake Garda which is the largest lake in Italy. 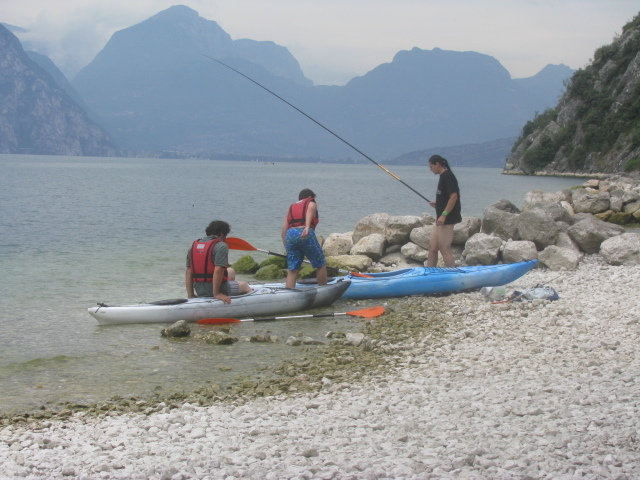 LAKE GARDA: Measuring 52 kilometers long and 17 kilometers. Ham shaped the lake stretches beyond Trentino into Veneto and Lombardia, covering a water surface of 360 square kilometers. It is among the most popular resort lakes of the region for people who love to fish and prepare lake fish, and for those who practice water sports. LAKE GARDA’S FAMOUS FISH: TROUT, CARPIONE AND SALMERINO: These three types of fish belong to the Salmonidae fish family and are fresh water fish. They have scales and small adipose fins, and vary in size and flesh color. All feed on small mollusks and shrimp and have a well developed set of teeth. Salmon are similar to trout but have a more elongated and compressed body. Among the ancient northern Italian lake-salmon fish varieties described by regional chefs, Lake Garda’s Carpione is especially praised. According to 19th century Northern Italian fish expert Floreste Malfer,(Livio Parisi p.50), this fish variety prefers the deepest areas of the lake and was considered a culinary delicacy by the ancient Romans. During the 17th and 18th centuries, Carpione fish was an elite variety served by the nobility. Today Carpione has become rare and is not easily caught. 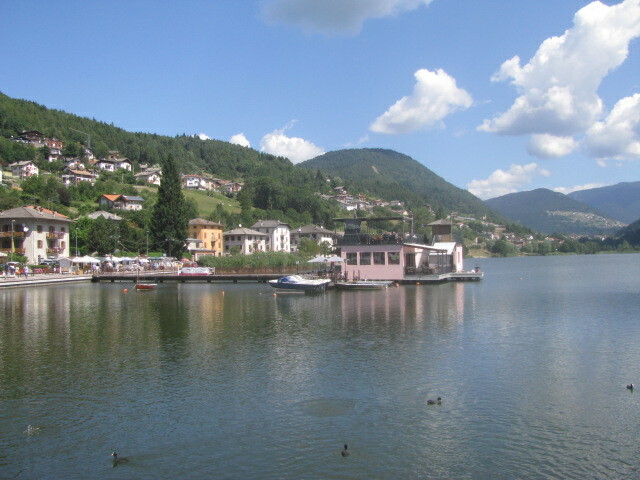 Commercial attempts to move Carpione to other Northern Italian lakes or to raise this variety on fish farms have been unsuccessful. Carpione is available sporadically in Riva or in Torbole when it is caught and sold by a local fisherman named Alberto Raina, who recently quit factory work to become a Lake Garda fisherman. Fishing season for the Carpione is from late August to Mid-November and from February to June, with October being the most favorable month. For more information on this lake fish: http://www.slowfood.com/ and http://www.upsdelgarda.it/ [Unione Pescatori Sportivi del Garda]. 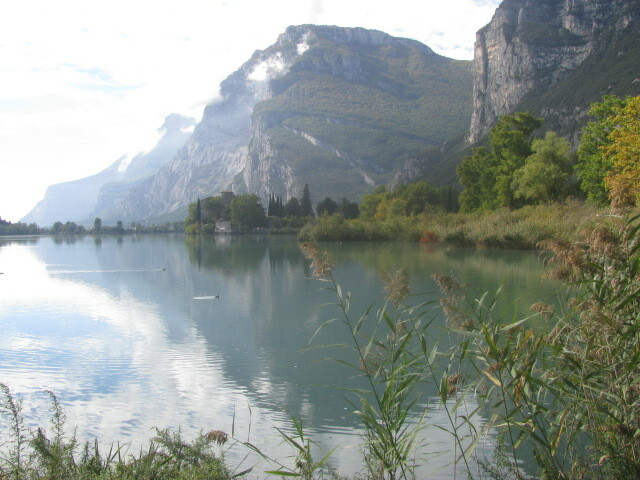 TRENTINO’S POPULAR LAKE AND RIVER FISH: Lake and River Trout (Trota – Salmerino [Salmo trutta]); Lake Salmon (Carpione [Salmo carpio]); Tench (Tinca [Tinca tinca]); Pike (Luccio [Esox lucius]); Eel (Anguilla [Anguilla anguilla]); Carp (Carpa [Cyprinus carpio]); Burbot (Bottatrice also called Bosa [Lota lota]); Perch (Pesce persico [Perca fluviatilis], Coregone (also called Lavarello [Coregonus lavaretus]), Chub (Cavedano, also called Cavazzin [Leuciscus] and Lake-Bleak (Alborella [Alburnus alborella]. Prepare a marinade with the lemon juice, oregano [or marjoram] and olive oil. With a paper towel pat dry the pieces of eel, place them in a deep terrine and pour the marinade over the fish. Cover with plastic wrap and refrigerate for 3-4 hours. Heat the frying oil to 375 degrees Fahrenheit. Drain the pieces of fish and deep fry until golden brown. Prepare a similar marinade as before. After seasoning the fried fish with salt and pepper, place the fish in the new marinade. Top each serving with a spoonful of grated cheese. LAKE CALDONAZZO: Situated at an elevation of 449 meters above sea level, this lake covers an area of more than 5 square kilometers and is 9 meters deep in the center. 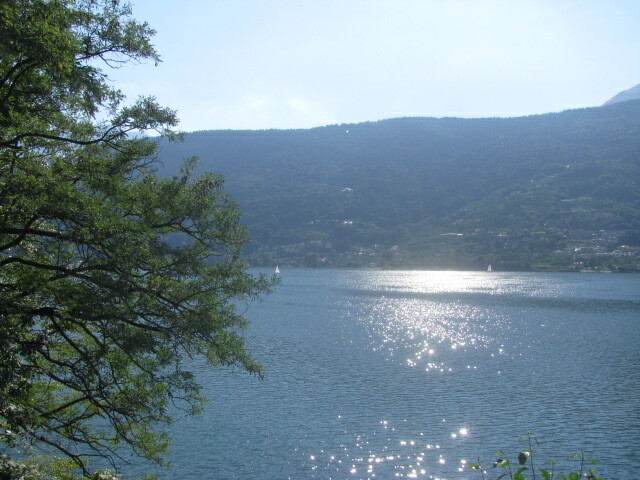 LAKE LEVICO: This lake is among the warmest lakes in Italy. Located near the Caldonazzo Lake, it is famous for its thermal spas which have been a favorite health spot for members of the Austrian Hungarian imperial family, including Empress Elisabeth of Austria. It has a surface of about 1,164 square kilometers and is 38 meters deep. 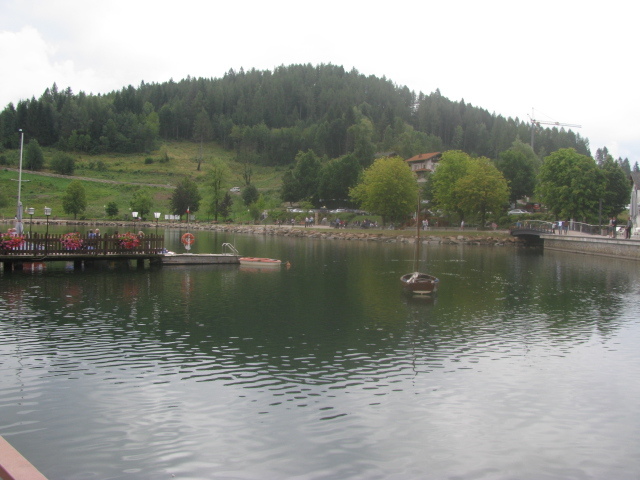 LAKE MOLVENO: This lake is 4 kilometers long with a surface elevation of 864 meters and a depth of 120 meters. 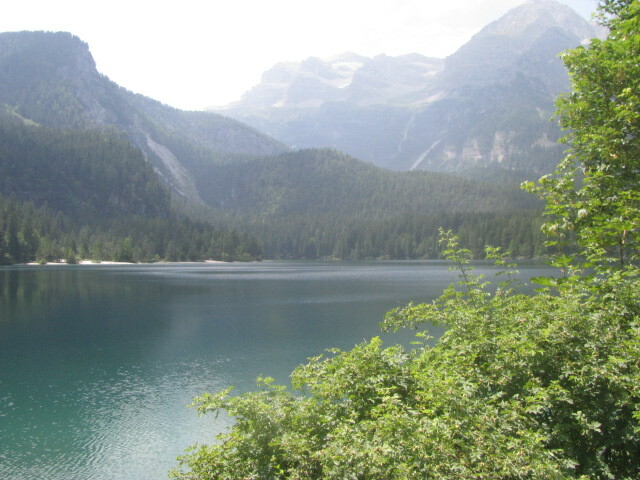 Lake Molveno is located east of the Brenta Dolomites. LAKE SANTA GIUSTINA: An artificial lake built in 1943 when the need of electricity and irrigation brought forth a reservoir building project. This lake supplies water to the orchards and vineyards of the Val di Non now famous for its apples and is fed by the water of the Noce River. The lake has a water containment capacity of 182 million cubic meters and measures 8 kilometers long by 1 kilometer wide. LAKE LEDRO: This small lake is famous for its clear and warm summer waters which can reach 24 degrees C, and also for its pile dwellings dating back to the Bronze Age. 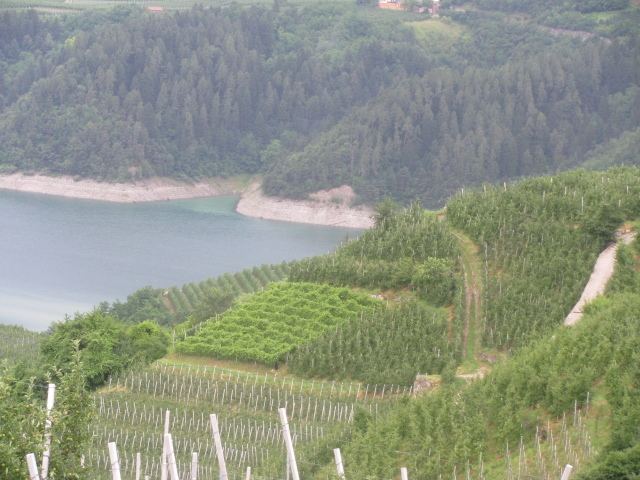 Situated just 15 kilometers from lake Garda, Lake Ledro is 3 kilometers long and 1.5 kilometers wide. LAKE TOVEL: This lake is also called the Red Lake, because of a history of red water color caused by floating algae during the summer months, a condition which today shows up only rarely. Located north of the Brenta Dolomites, Lake Tovel is considered the jewel of the Adamello Brenta Nature Park. The lake has a surface of 360,000 square meters and a depth of 39 meters. 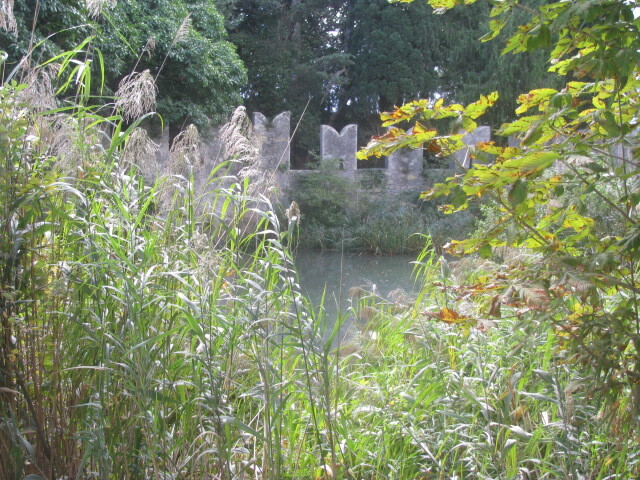 LAKE TOBLINO: This small lake is known for its castle which was once a residence of one of the Prince Bishops of Trento. 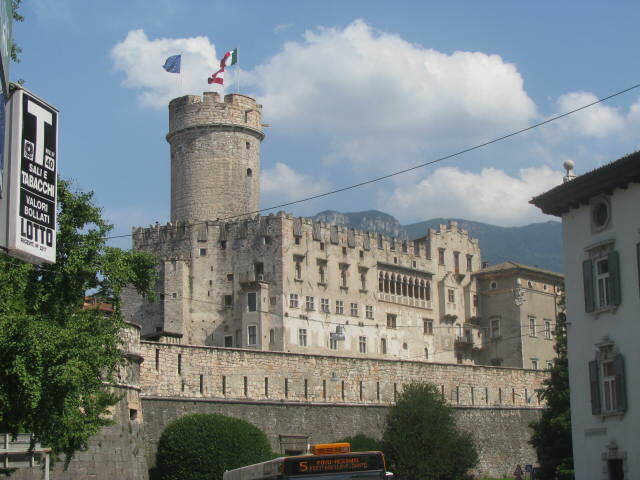 There are stories of Carlo Emanuele di Madruzzo, Trento’s bishop by family will and not by choice. who did not want to be a man of religion but rather a husband to Claudia Particella with whom he retired to the castle. Legend has it that fairies lived in the castle, and that Attila the Hun once stopped at Lake Toblino and was struck by the beauty of the lake and surrounding. LAKE DELLA SERRAIA DI PINE’: This small glacial lake dates back 15,000 years and covers a surface of 656,250 square meters with an approximate depth of 15 meters in the center. TRENTINO’S LAKE AND RIVER FISH: Lake and River Trout (Trota – Salmerino [Salmo trutta]); Lake Salmon (Carpione [Salmo carpio]); Tench (Tinca [Tinca tinca]); Pike (Luccio [Esox lucius]); Eel (Anguilla [Anguilla anguilla]); Carp (Carpa [Cyprinus carpio]); Burbot (Bottatrice also called Bosa [Lota lota]); Perch (Pesce persico [Perca fluviatilis], Chub (Cavedano, also called Cavazzin [Leuciscus] and Lake-Bleak (Alborella [Alburnus alborella]. Among the fish product sold by this small fish farm located high up in the mountains where the glacial waters of alpine lakes still flow clean and abundantly are: smoked trout, marinated trout and salmerino, trout eggs, smoked salmon trout and smoked salmerino as well as fresh trout, fresh salmerino and fresh salmon trout. Prepare the marinade by combining all ingredients in a suitable non metallic container. Add the pieces of fish, cover, refrigerate, and let the pieces marinate covered for about 48 hours. Serve the fish with bread or with polenta.